Session Breakdown Service Design Thinking Service Design Doing 30-minutes 60-minutes This is where I’ll do some talking and provide an overview of service design thinking — the This is where you’ll get your hands dirty mindset, skillset, principles, methods, tools, and overall objectives of the discipline. and experience the collaborative and participatory nature of service design doing. Service design is a holistic, participatory, and cross-functional approach to improving end-to-end human experiences, as delivered through digital, physical, virtual, or human touchpoints. Service design is a holistic, participatory, and cross-functional approach to improving end-to-end human experiences, as delivered through digital, physical, virtual, or human touchpoints. Service experiences need to balance user and employee desirability, business viability, and operational and technical feasibility. Jargon Frontstage / Backstage In services, there are things the customer does and doesn’t see—we call this frontstage and backstage. Think of it like theatre: backstage is what is done behind the curtain to support the actors, who are frontstage, and they’re who you see in front of the curtain. Those on the backstage do just as much to shape the experience as those on the front stage. They help to deliver the service, play an active and critical part in shaping the experience, and represent a company’s brand. Jargon People (a.k.a. “Actors”) Anyone who creates or uses the service, as well as individuals who may be indirectly affected by the service. • Service Customers purchase (or have the authority to purchase) the service. • Service Users directly use the service to achieve a specific outcome. Frontstage Service Employees deliver all or part of the service directly to the user. • • Backstage Service Employees perform background functions in support of the service delivery; the user doesn’t see or interact directly with these people. • Partner Service Employees are involved in delivering the service. Jargon Props The physical or digital artifacts (including products) that are needed to perform the service successfully. Jargon Processes Any workflows, procedures, or rituals performed by either the employee or the user throughout a service. Jargon Places The physical space or the virtual environment through which the service is delivered. Jargon Partners Partners include other businesses or entities that help to produce or enhance the service and contribute to delivering the service outcome. THINKING This worksheet is intended to help you think holistically to frame and scope the opportunity ahead. FRAMING THE SERVICE EXPERIENCE SERVICE USER Which experience will you improve? For whom? OUTCOME TRIGGER ENDING What outcome does the service user hope to achieve? What initiates the service experience? What causes the service experience to end? USER MOTIVATIONS MOTIVATING DEMOTIVATING What value does the service user seek from the experience? What can deter this person from using the service? CONSTRAINTS & REQUIREMENTS BLOCKERS ENABLERS DEPENDENCIES What might stop or slow you down from delivering your service experience? What tools and training make it possible to deliver your service experience? Who or what must be available for your service experience to succeed? SUCCESS INDICATORS What are 5 ways you can evaluate whether the service has been successful? This can be both qualitative and quantitative. 20-Minutes 01. Thinking Identify (or choose) a specific service experience and complete the first worksheet to help frame your problem space. 30-Minutes 02. Doing Start sequencing the details of your service experience in a service blueprint from beginning to end, front to back, and across all channels. Use the template provided. 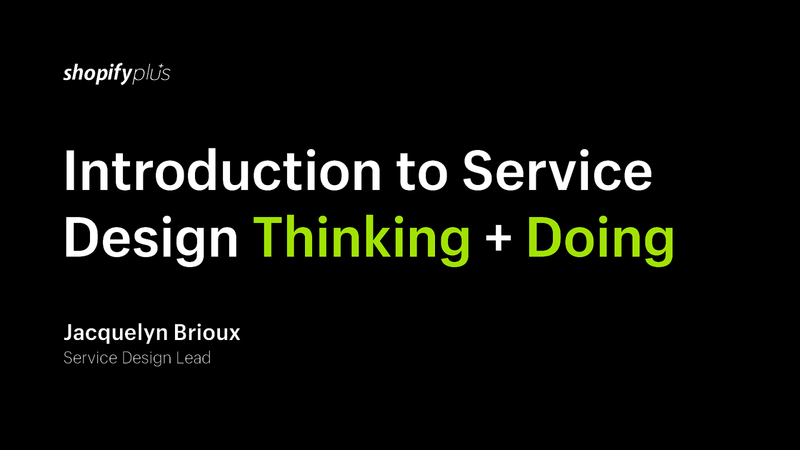 View Introduction to Service Design Thinking & Doing on Notist. In this introductory 90-minute workshop, you’ll have a chance to sit back and learn a little about the fundamentals of service design—what is service design (definition, lifecycle, process, methods, tools); what does it take to be a service designer; how to build a service design capability; and some critical jargon to get you started. Next, you’ll roll up your sleeves to work through a real service experience challenge as a group using two worksheets: problem framing and service blueprinting. The first worksheet helps you frame the service and reflect on user motivations, constraints, requirements, and success indicators. The second worksheet helps you sequence the various stages, actors, actions, and touchpoints of the service experience from beginning to end, front to back, and across all channels. Lastly, we’ll discuss what’s next—how to leverage this process to drive real impact and how to measure it along the way, learning and iterating as you go. Get energized during group work time with a mix of obscure and recognizable tunes while I walk around the room to field questions and help teams get unstuck.